FreightWaves Market Expert Dean Croke takes a look at the subject of sleep. By providing an overview of the science of sleep, FreightWaves explains why it’s the missing component in the current Hours of Service (HOS) debate about “flexibility” – the one word that will change everything. The importance of incorporating the science of sleep into a trucking operation is also covered. About Dean Croke: Having grown up in a family trucking business and then spending years as an over-the-road truck driver and manager of large trucking fleets, Dean has combined his practical experience with an extensive knowledge of human physiology in the development of world-class driver scheduling and sleep management programs. The biggest issue with the entire hours of service (HOS) debate is that most people are focused on the wrong thing, completely missing the point of the process, which is to keep tired drivers off the road. If that’s really the goal of the HOS regulations, then regulating sleep has to be a core component of the current “flexibility” debate. Why it matters: A commercial truck driver can be 100 percent compliant with the HOS regulations, yet sound asleep at the wheel at the same time. This means safety and compliance aren't mutually exclusive, with one study showing drivers on paper logs recorded a 30 percent lower U.S. Department of Transportation (DoT) Recordable Accident rate compared to drivers using electronic logs. The difference is because paper logs afforded drivers a degree of flexibility that allowed them to schedule work and rest periods around their preferred sleep preference and sleep personality (but record something different in the log). Many safety experts say that this non-compliance is unsafe when in reality it’s the opposite from a driver's perspective (because they actually sleep when they are tired). The reverse is true today with electronic logging devices (ELDs). Time is recorded digitally, forcing drivers to often drive when tired and then attempt to sleep at times of the day when it’s impossible to do so (such as during daylight hours). Exacerbating the problem are prescriptive rules including the “14-hour clock,” which prohibits driving beyond the 14th hour of work regardless of sleep and rest breaks within that time frame. Since research shows a 30-minute nap can give a driver a four-hour boost in alertness, not allowing naps to extend the workday seems illogical at best. The physiology of sleep tells us that humans are hardwired nocturnal sleepers and have evolved to wake at sunrise and begin the sleep process when the sun goes down. Even though there are hundreds of circadian rhythms (24-hour cycles) that drive the sleep-wake process, light (and in particular blue light), is the single most influential factor in determining when we sleep and wake. To understand the power of light, think about those times when you have traveled to another country and experienced “jet lag” (you “jet” to a new time zone but your body clock “lags” behind). It may take quite a few days to adjust your body clock to the new time zone. For most people, it takes one sunrise in your new destination to move one time zone closer, so if you fly to London from New York it will take five sunrises in London for the body clock to move through five time zones. Why the sky is blue is fundamental to understanding the sleep-wake process and why truckers are so out of sync with HOS regulations and so passionate about flexibility. The sky is blue because that’s the color that gets refracted the most. This is because of blue’s shorter wavelength bouncing off molecules in the air and scattering its light more than other colors. At sunset we see more red and orange in the sky because the blue light has been scattered out and away from the line of sight. As a result, our eyes are sensitive to blue light, which is also why you have a “Night Shift” setting on your iPhone display settings to reduce blue light at night. To demonstrate how the timing of light impacts truck drivers, let’s look at a common situation in which drivers who work at night drive through sunrise and in the process receive the blue light signal via the optic nerve. This signal tells the body clock to begin the waking process in readiness for another day of peak activity. In this example. the drivers’ 10-hour break now starts at 9:00 a.m., which means that even though they feel extremely tired, they are unable to sleep because their brains are trying to wake them up. This is why drivers who sleep during the day only manage (on average), four and one-half hours of sleep per 10-hour block. Compounding the problem is that their sleep quality is severely diminished as “day sleep” is more fragmented and lighter in nature. Measuring sleep in “cycles” and not hours: One of the myths about sleep is that the more of it you get, the better you feel, when quite the opposite can be the case. Six hours of sleep is better than seven, yet seven and one-half is better than six – why is this? Human sleep follows what's known as an ultradian cycle, in which events occur every 90 minutes – sleep cycles included. When you drift off to sleep your brain goes through various stages in succession over an approximate 90-minute period – light sleep, deep sleep and rapid eye movement (REM). Deep sleep accounts for about 75 percent of night sleep with REM accounting for the remainder, but what sets them apart is the restorative functions they perform. During deep sleep your brain is unconscious but your body is tossing and turning – you can’t hear things such as a baby crying or a heavy thunderstorm. Your body is effectively in the repair shop where the human growth hormone (HGH) is released, facilitating the maintenance and repair of bones, ligaments, muscles, skin, organs and hair. Think of deep sleep as the time when physical fatigue is dealt with. REM sleep is quite the opposite and occurs towards the end of the 90-minute sleep cycle as the brain begins to wake and major muscle groups go into a state of paralysis so that you don’t act out your dreams. Your eyes stay active, which explains the REM characterization of this sleep stage as your eyes dart back and forth. During REM your brain is buzzing with electricity – so much so you could power a 10-watt light bulb from this stage of sleep. This phase of sleep is the mental restorative process and deals with learning, mood, emotion and memory consolidation. You dream in all stages of sleep, it’s just that during REM your dreams are the most vivid (and at times bizarre). Over the course of a night, dreams increase in frequency and intensity with the last sleep cycle being mostly REM – that’s why your most memorable dreams are the ones that occur just before you wake. Good quality sleep comes from getting all stages of sleep over the 90-minute period and if you’ve ever woken from a one-hour nap (the most common duration of naps for truckers) and felt worse, now you know why. When you wake at the one-hour mark you experience what’s known as sleep inertia – you feel groggy, tired, lethargic, and moody. Sleep inertia lasts about 20 minutes before it dissipates. This means your new napping strategy should include either short 20- to 30-minute “power naps” (ending just before the brain drifts into deep sleep) or blocks of 90 minutes to coincide with the end of a REM period (when the brain is already wide awake). The key to a great night's sleep is simply putting together multiple blocks of 90 minutes, meaning sleep duration should now be measured in sleep cycles of multiples of 90 minutes (1.5, three, 4.5, six hours and so on). The bare minimum the human brain needs is six hours of sleep every 24 hours, which is why most performance-based HOS programs mandate six hours of continuous sleep during the off-duty period with naps being supplemented at various times adding to the daily cumulative total. Setting your alarm clock: Armed with this new knowledge of measuring sleep in 90-minute cycles instead of just hours, the next step is to learn how to set your alarm clock and ensure you wake at the right stage of a sleep cycle. Most of us do it backwards – we set the alarm clock based on what time we have to be at work and are either waking before the alarm (at the end of a REM cycle) or not hearing the alarm at all because we’re in deep sleep mid-cycle. The next time you set your alarm clock, set it to coincide with the end of a full sleep cycle. If it takes you 20 minutes to fall asleep, and you have an eight-hour block of time before you have to get ready and go to work, set your alarm clock for five sleep cycles – or seven and one-half hours plus 20 minutes. However, if you only have seven hours of sleep opportunity time, set the alarm to coincide with four sleep cycles, or six hours plus 20 minutes. You should avoid setting the alarm clock if you’ll be forced to wake during the middle of a sleep cycle. 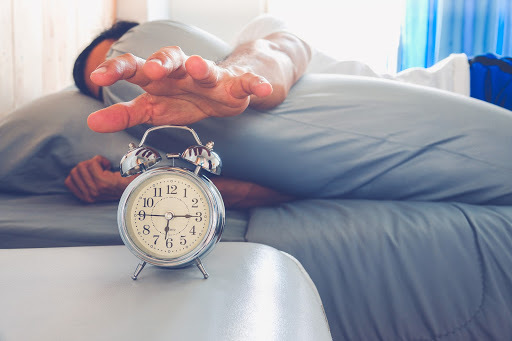 It may sound counter-intuitive to wake before your alarm and get out of bed, but you will feel much better because you will have avoided sleep inertia (which at times can last all day). Temperature – you sleep best when your body temperature is coldest. Make sure the room temperature is cooler than normal, and around 65-66 degrees Fahrenheit seems to be a favorite for most expert sleepers. Light – your sleep environment has to be as dark as possible, and by “dark” we mean so dark you can’t see your hand in front of your face. Even go as far as turning your alarm clock away from you so that the green or blue LED lights don’t trick you brain into thinking it’s daylight outside. If you're a shift worker then heavy double insulated drapes are a must. Noise – depending on whether you are a light or deep sleeper, noise can be either soothing or disruptive. If you’re a light sleeper then “white noise” is a great idea because it will act as a blocker to loud and infrequent noises from outside that occur during REM (if you’re going to wake during the night it will be approximately every 90 minutes). White noise in the form of a fan or similar device will help you stay asleep. It takes about 20 minutes to reach the brain-alerting receptors before taking effect (so drink coffee before a 20-minute nap so you wake right on cue). It has a half-life of about six hours, which means that if you have a coffee that contains 200 milligrams of caffeine around 4:00 p.m., at 10:00 p.m. 100 milligrams will still be trying to keep you awake (possibly delaying the opening of the sleep gate). The general rule with caffeine is avoid it after 3:00 p.m. or 3:00 a.m. depending on which shift you work. That way the alerting effects of caffeine will have worn off sufficiently allow you to drift off to sleep. One of the biggest mistakes the trucking industry makes is assuming that just because a driver had a 10- or 12-hour break, he/she must therefore have had adequate rest and be fit-for-duty at the start of the next shift. This couldn't be further from reality and in part explains why drivers often say, “I’m fatigued but not sleepy,” or “I’m sleepy but not fatigued” – both can be true at different times of the day and night. It all comes down to when work and rest occur and in a perfect world if every night shift could end before sunrise, drivers would sleep just like every other nocturnal sleeper and be a much healthier, safer and happier work group. Because the timing of light is constantly changing and creating what is known as “industrial jet lag,” truckers are often out of sync with their body clock, often feel frustrated and struggle to articulate why, pleading for flexibility in regulatory design to allow work and rest to align with how they feel. Imagine all the flexibility of a paper log embedded in an ELD and you begin to see what drivers are asking for – they don’t want to work more hours, they just want to work their allotted hours differently. Allowing drivers to put together their 11-hour on-duty driving and 10-hour off-duty blocks however they see fit is key. As long as the numbers add up to 11 and 10 at the end of a 24-hour period, there should be no issues as to how they work it out. This is why drivers want the 30-minute rest break at the eight-hour mark dropped since they are already taking that break as they wait around on loading docks. They also want the 14-hour clock workday limit expanded, or dropped to accommodate their sleep preferences. There have to be some guard rails for drivers with this approach since the number-one risk factor for severe accidents is a variation in the day-to-day start time. The flip side of fluctuating start times is sleep truncation and/or disruption – either way, the risk of serious wrecks rises exponentially if drivers can’t lock in their “anchor sleep,” which is sleep at the same time and in the same place every day – just like nearly everyone else on the planet. This is why drivers get so frustrated when members of management ask them to be productive, on-time, courteous and safe on the road, yet never give them the opportunity to get the right amount of quality and quantity sleep to do so. Anchor sleep is vital and it’s central to any bio-compatible scheduling program in which driver sleep requirements and preferences are integrated into load dispatch and routing workflows. Most industries – including trucking – focus on regulating hours worked with the premise that a driver will be well-rested for the next period of work. The problem is that no one teaches the driver how to rest. For drivers, it’s hit or miss, since the timing of sleep can occur at any time during the day depending on schedules and load requirements. If the industry were to regulate daily sleep requirements as proposed by the Hours of Sleep project in 2006, then not only would road safety improve, drivers would feel much better about themselves and their jobs. Essentially, we’re currently regulating the wrong thing. Getting the right balance between work and rest is the most important factor. Drivers are creatures of habit, so developing a set routine of days on and days off is not only important for personal reasons, it allows drivers to dispel accumulated sleep debt from the previous week of work. Sleep debt (the difference between what you need and what you get) accumulates rapidly, and even though you don’t need an extra hour of sleep for every hour you miss, you do need two periods of consecutive nights of sleep every seven days to reset the sleep debt to zero. This partly explains why most long-distance truckers are so tired – because with the current HOS rules for 34-hour restarts, they’re only getting one period of night sleep every seven days. Missing that second night of sleep means that their sleep debt slowly builds over successive weeks, resulting in what’s known as “cumulative fatigue.” Because it appears gradually, drivers slowly feel worse and worse, but are unable to pin the cause on anything specific. For new drivers in the industry, cumulative fatigue hits around the 90-day mark, which coincides with the spike in new-hire voluntary terminations. Completely darkened sleeper berths so that light does not interfere with sleep. 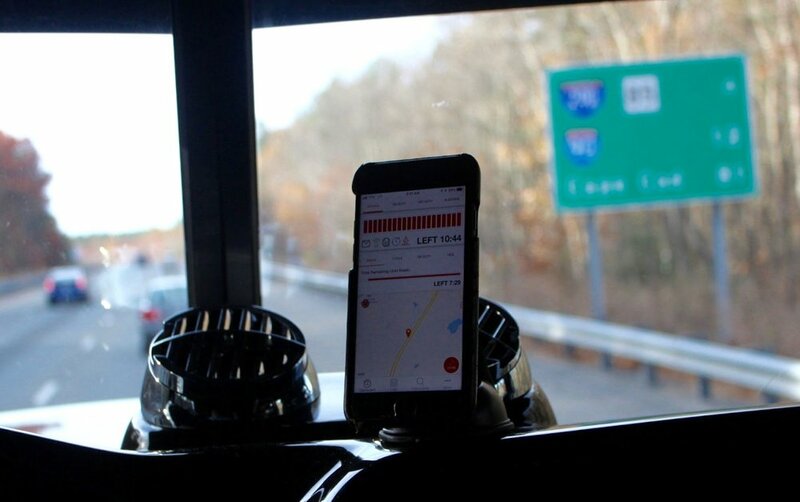 Separate heating and cooling systems for sleeper cabs so drivers (and their neighbors) aren’t being woken by truck engines starting up repeatedly. Clean bed linen and a mattress of high quality – memory foam is highly recommended by truckers. Drivers and fleet managers must first educate themselves in the science of sleep, thereby allowing bio-compatible scheduling practices to follow. Notice we are very careful not to use fatigue education here because fatigue is a symptom of sleep deprivation and/or disruption, not the cause. Make sure each shift starts around the same time every day. That way “anchor sleep” occurs at the same time. When booking appointment times for loads, factor in the drivers’ preferred sleep and driving patterns. Teach drivers to pull over when they’re not tired and trip-plan accordingly. Telling drivers to pull over when they’re tired is like saying drink water when you’re thirsty; it’s too late since you’re already dehydrated. This may sound counter-intuitive, but it works. ELDs produce a rich stream of reliable data that is incredibly valuable when measuring risk and accident probability. Most data science teams are very good at identifying the driving and rest patterns that correlate to accidents with the most successful companies being those that use HOS compliance data to better understand driver risk profiles. A minimum of six hours of continuous sleep every 24 hours – at a time of the driver’s choosing. Two periods of night sleep every seven days to dispense any accumulated sleep debt. A period of night sleep must span the hours of 8:00 p.m. to 8:00 a.m. (i.e., no work can occur during this period). Naps placed strategically throughout the day. Naps replace the current 30-minute break at the eight-hour mark with the timing at the driver’s discretion (i.e., when he/she is actually tired). Same start time every day (give or take 20 minutes). Despite the fact that most severe accidents occur between midday and 5:00 p.m., drivers are four times more likely to have a severe accident between midnight and 5:00 a.m. Drivers are three times more likely to have an accident during night-time hours (6:00 p.m. – 6:00 a.m.) compared to daytime hours (6:00 a.m. – 6:00 p.m.). The average accident cost is highest between the hours of 3:00 a.m. and 7:00 a.m. The relative risk or probability of a severe accident is highest when the human body is designed to sleep (i.e., when core body temperature drops to conserve energy between 11:00 p.m. and 7:00 a.m.). In another published study conducted over a six-month period by a large telematics company in which 1,651 drivers attended sleep education classes (representing 44 percent of the driver population), some amazing results were produced. Incurred an average accident cost 7.2 times higher. Had twice as many loss-of-control accidents. Experienced five times as many “run-off-road” accidents. Had one rollover compared to 14 in the control group (the fleet’s normal rollover rate). Were 30 percent less likely to voluntarily terminate their employment. Were 6.75 times less likely to have a service failure (running late while under dispatch). The productivity gains are also substantial since it’s a well-known fact that well-rested drivers run more miles. Numerous studies show drivers who are taught how to sleep during their off-duty time run about 10 percent more miles per tractor-week. When the “Hours of Sleep” exemption application was proposed to the Federal Motor Carrier Safety Administration (FMCSA) in 2006, it included all of the bio-compatible requirements listed above with productivity benefits including an extra hour of rolling time every 11-hour shift. This equated to an extra 50 miles per day, which would have made a significant impact on operating margins and would have given drivers the equivalent of a $0.02 per mile pay raise. According to SONAR (Ticker HOS11.USA) drivers are only averaging 6.75 hours on-duty/driving for every 11-hour shift, which means they’re only using around 60 percent of their maximum allowable driving hours each day. This suggests that something is not right with the current regulatory framework and since driver pay is a big part of why the industry is so unattractive in the current labor market, finding ways to boost productivity through flexible regulations would seem to be a step in the right direction. The FMCSA rejected the exemption application on the grounds that the entire industry was not yet using ELDs, and until such time as that happened, the agency would not reassess the situation. Maybe now is the time to apply for more flexible performance-based HOS regulations with the ELD mandate fully implemented. Allowing drivers the flexibility to structure work and rest around their own personal requirements – accompanied with the appropriate sleep education – will have a profound impact on trucking in the United States as it already has in other countries.